This little number has become a regular dish in my house, ever since I first tried to make it. 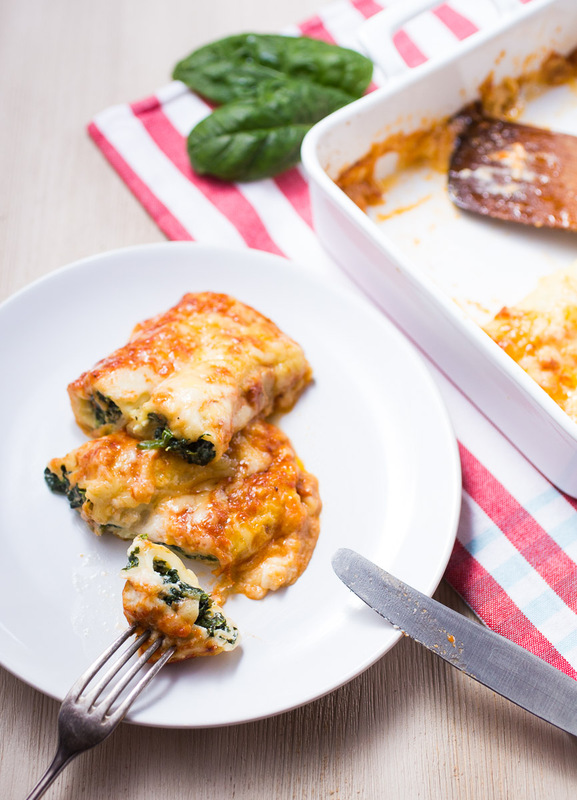 Thin crespelle or crepes filled with a creamy ricotta and spinach sauce, baked in tomato sauce and topped with cheese. It doesn’t get any better than that and this dish is definitely worth the effort. 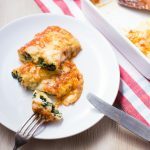 Being a huge fan of italian cuisine I often had crespelle with ricotta and spinach at restaurants until I finally found recipe that worked for me at home. What made the difference for me was the spinach. 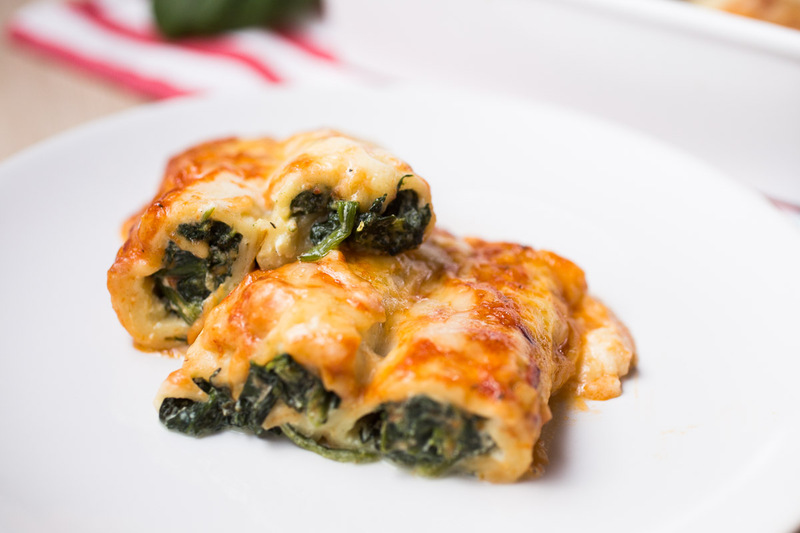 You could by all means make this with frozen spinach, but it won’t taste the same. I know that frozen veggies are a great alternative and they still have all the nutrients, but trust me on this one, fresh spinach is way to go in pasta dishes. 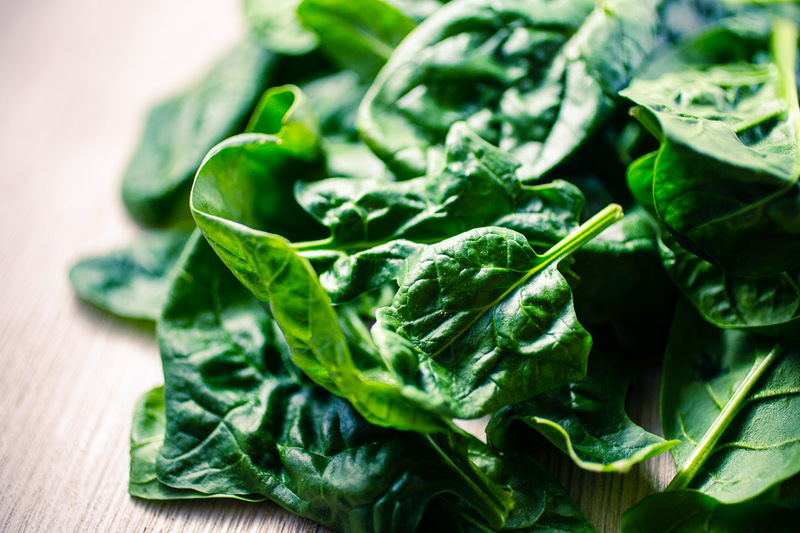 The texture and taste of fresh spinach is irreplacable. I have seen (and eaten) this dish with different kinds of crespelle, ranging from thin ones like I make them to nearly pancake like thingies. 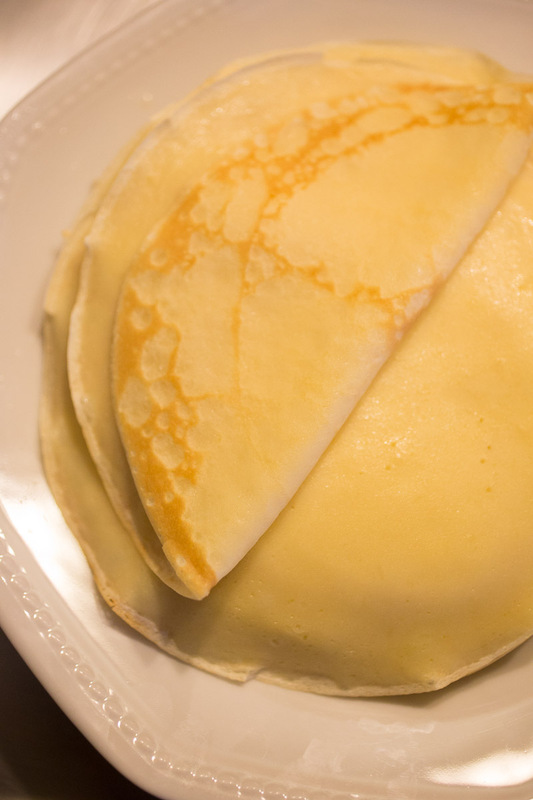 This recipe calls for thin, thin crespelle and I have been told that those are the authentic italian kind. So get your best non-stick pan and bake them as thin as you can. They shouldn’t be any thicker than canelloni pasta. The filling is fairly easy to prepare. The ricotta does most of the work for you. No need for fancy rouxs or anything. The ricotta will form a nice and creamy sauce for you that will thicken even more in the oven and make the crespelle cuttable later. 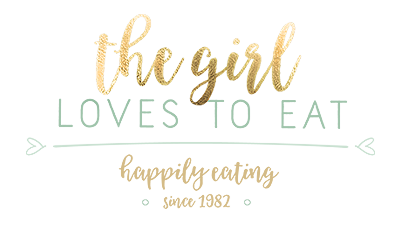 One final note for all you working gals and boys. I always like to make more crespelle than I would need for dinner. I fill them, place them in a container and freeze them. 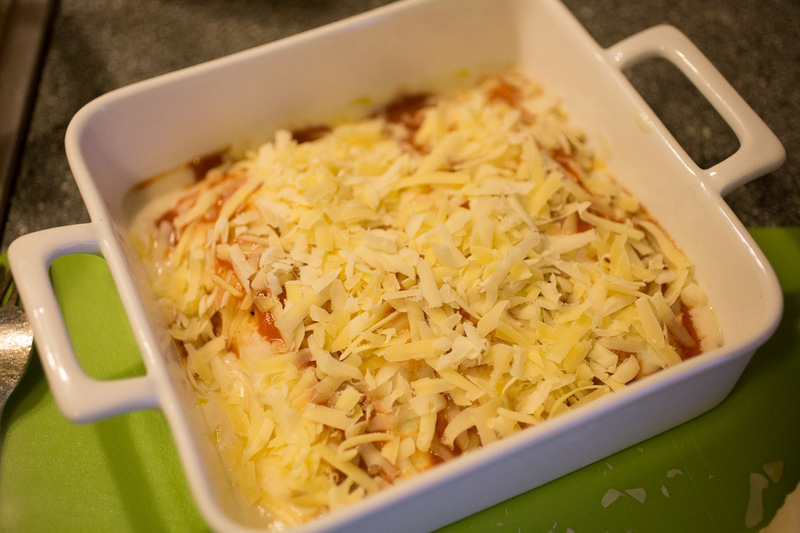 After a busy day at work when I’m in no mood for cooking I just place them in the oven dish add some tomato sauce and cheese and bake them. Voilá… super-fancy fast food. Crepes filles with creamy ricotta and spinach sauce. 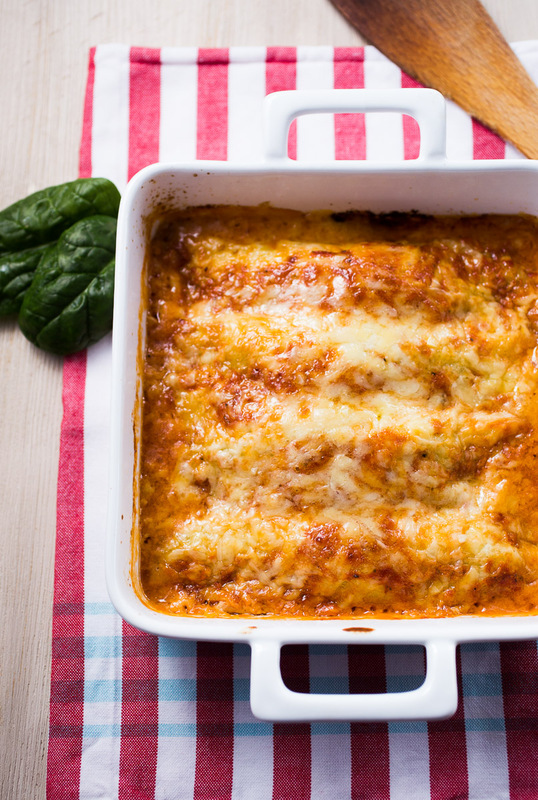 Baked in tomato sauce and topped with cheese. 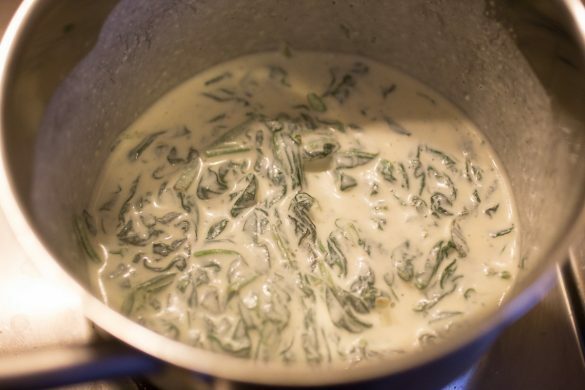 In a bowl whisk together the eggs, flour milk and salt. 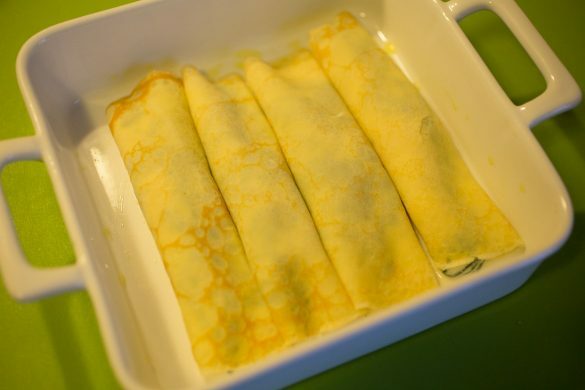 In a small non-stick pan bake thin crepes (you should get around 12 with this recipe) and set aside. Heat a tablespoon of olive oil in a pot and add the onion and the garlic. Fry for 3-4 minutes. 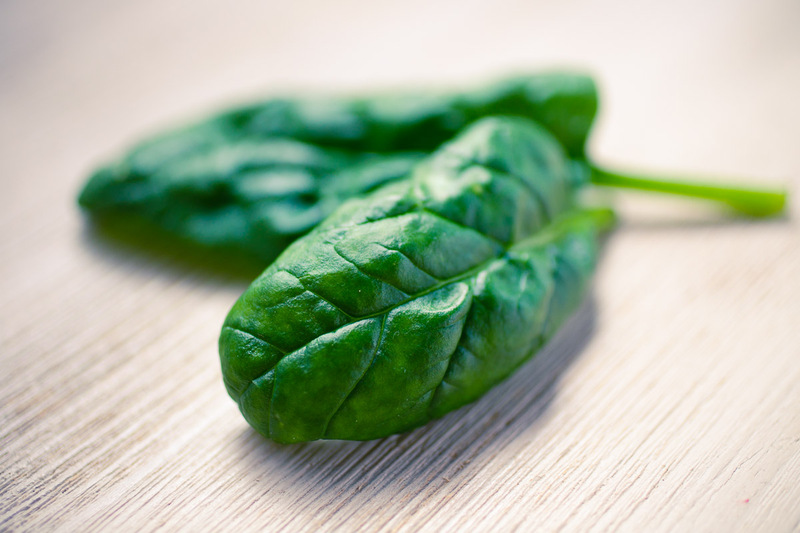 Add the washed and drained spinach leaves, cover the pot and let it wilt for a few minutes. Add the white wine and the ricotta. Stir well. Let the sauce cool down a bit. Place one crepe in front of you and spread one heaped tablespoon of the filling on the lower half. 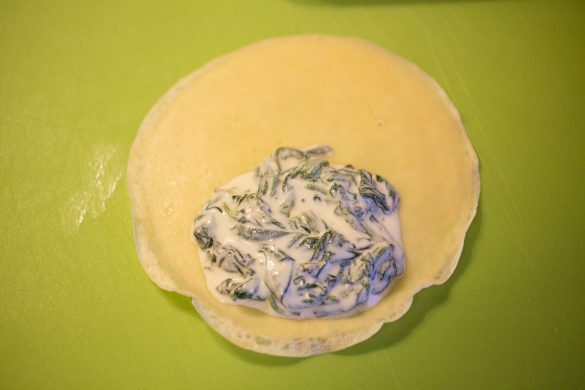 Roll it up and place with the seam down in an oiled oven dish. 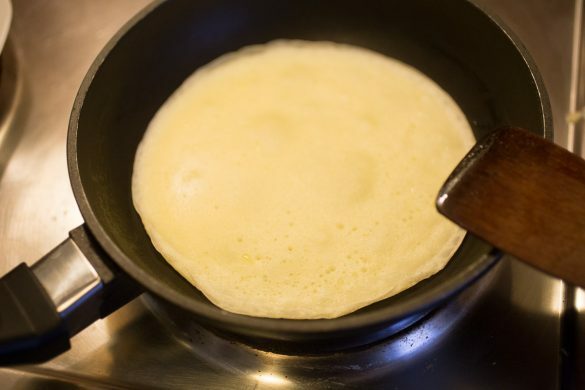 Repeat with the remaining crespelle. Season the tomato sauce with salt and pepper and spread over the crespelle. 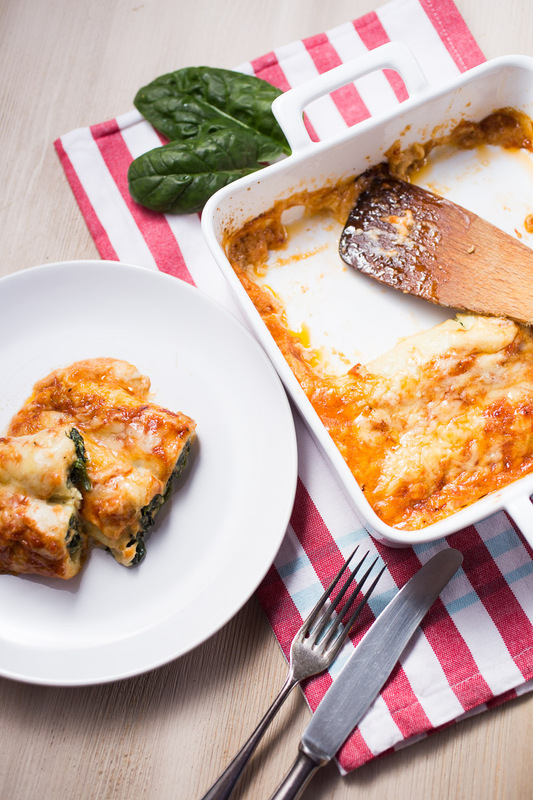 Sprinkle with cheese and bake in an 180°C / 356°F hot oven for 25-30 minutes or until golden brown on top.